I'd been wanting to make Sprinkles strawberry cupcakes for a while now, and they seemed a bit Easter-ish, so that's where I started. You apparently have to follow the recipe from this YouTube video (click on "show more"), because the recipe posted on MarthaStewart.com and elsewhere is wrong. Overall, I really liked the taste of these cupcakes - though I probably could have taken them out a minute or two earlier. The frosting, on the other hand, was aaaaa-mazing. I doubled the recipe for both the cupcakes and frosting, and instead of 7 cups of confectioners sugar I only used 6. There, it's in writing... one time in my life I used less sugar than I was supposed to. Any more and I felt like the sweetness would have overwhelmed the strawberry flavor. Once everything was baked and mixed, it was time to decorate. My mom has always made a Peep cake for Easter, so I decided to carry on the tradition - with a twist. 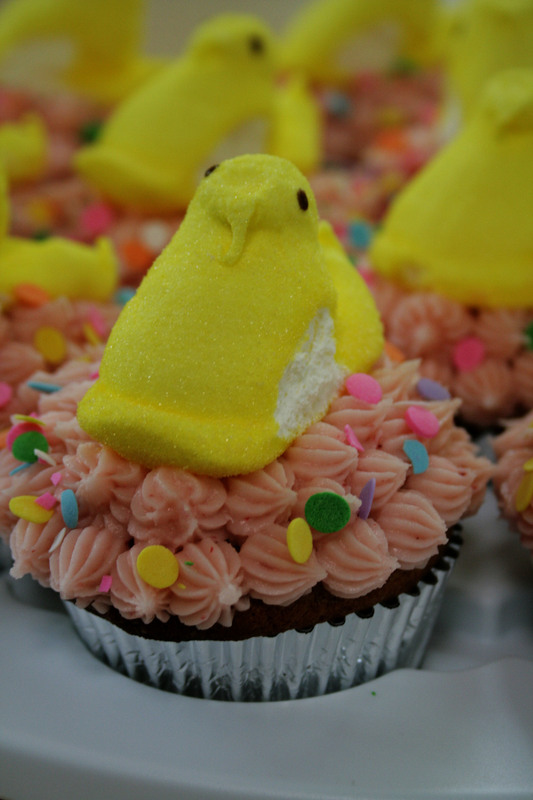 I smeared a bit of frosting on the bottom of a Peep, stuck it to the cupcake, piped drops of frosting around the Peep using an Ateco #32 piping tip, and finished with a pinch of sprinkles.